The Incredible Hulk #182 is considered the final comic book in a trilogy that contained appearances by Wolverine. 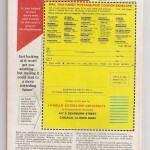 The Incredible Hulk #180 contained a cameo of Wolverine on the back page. 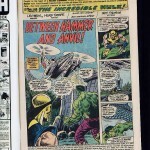 The Incredible Hulk #181 is considered even more significant because it was the 1st full appearance by Wolverine, and it’s the most valuable comic book of the three. In issue #182, there is a cameo by Wolverine on the 1st page. While the values of The Incredible Hulk #182 is generally the lowest of the three comic books, it still has good value, especially if your book is still in mint condition. Any type of wear & tear (like most comic books) will dramatically lower the value you can get if you wanted to sell. 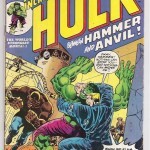 It’s not very difficult to find Incredible Hulk #182 comic books for sale , and ones that are not in very good condition are usually worth under $100 dollars. 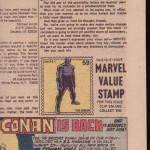 If the Marvel Value Stamp is removed, or other parts of the book are removed or damaged, that will reduce the value even further.